With the latest update to the Now and Voice Search apps, Google has quietly opened the floodgates for 3rd party apps to use its offline voice recognition tools. This is huge, as it will allow developers to feature voice commands and natural language recognition in their apps without the need for an Internet connection, hence keep your privacy intact. The possibilities here are endless and only limited by the devs imagination. One of the first apps to take advantage is utter!, which is not new per se, but now features the offline voice recognition, and via a download smaller than 2MB lets you command the phone with your voice without the typical need for data connection. The offline function will only work on Jelly Bean devices and above, of course. It runs in the background and is made to be very light and available anywhere you are in the interface by shaking the phone, waving or simply pressing a button. The real value in this undertaking is that none of your personal information is uploaded to Google's servers, which is a huge relief for people who regularly use Google Voice Search or Apple's Siri, for instance. In fact, the utter! promo video takes a jab at Siri indeed, so check it our below. HOLY CRAP THAT'S AWESOME! I love Dragon for my PC and now I can do something similar for my Android devices YES. wow it is great go google !!! Awesome, just please bring Hebrew support for offline dictation! I've been using Utter! for a few months now, excellent app. It just keeps getting better. This option was deactivated two weeks ago from Google for some phones because of performance reason. I do not understand the reason because on my Huawei Y300 I never got problems or performance issues with the offline voice recognition. Since it is not available anymore I get really huge problems. Not only that I was using it in China everyday, but also that it cant be used anymore. Voice recognition doesnt work online in China. The quality is really too bad. Some weeks ago I could still download the files, but now it is not possible anymore. I have Jellybean 4.1 and after a google update the download option was gone. So I didnt know what is the exact problem and I did a factory reset. Now also the offline files are gone and not possible to recover. 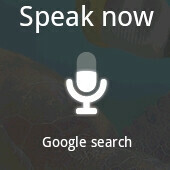 Google deactivated the download option for voice recognition. There are already some posts in the internet releated to that topic but google didnt answer or tried to fix it. Some were assuming it is because of low performance of Huawei y300 that causes problems when the voice detection is used offline. I used it before and I need it every day and I had never ever any problems. But since 1 week I cannot use it anymore. Anyone knows a solution? ?